Have you seen the new Carleton Varney collection for Frontgate? It is an absolute dream come true, and I want one of everything! 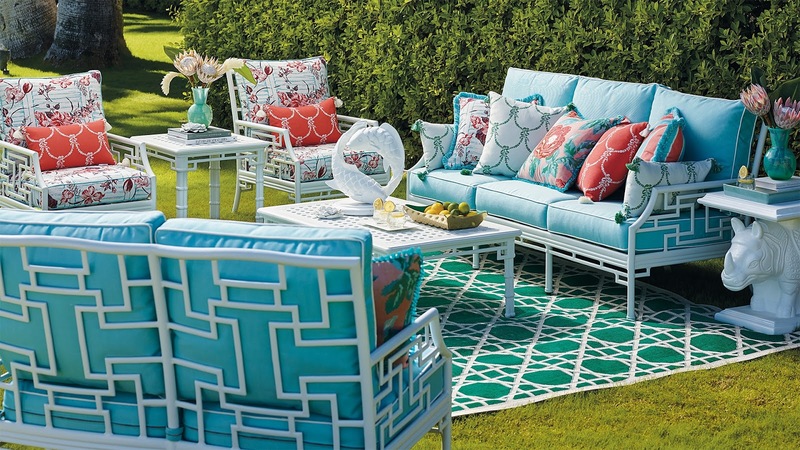 Each piece in the collection – which includes outdoor furniture, umbrellas, tabletop, rugs, and planters – is custom designed with Carleton’s signature style of vibrant colors, unique prints, and theatrical flair. The furniture ranges from a bistro table to deep seating to traditional dining. The Hillandale Rose collection presents whimsy in a unique bistro table, Ibis Isle gives a fashion-forward take on Chippendale design, and Giverny updates traditional neoclassic motifs. “I am particularly delighted with the melamine Caning Dinnerware that appears at first viewing to be fine porcelain,” said Carleton. Enter below… the winner will be announced next Monday! Exclusive to Frontgate, the Carleton Varney Caning Dinnerware features a jade Chinoiserie caning motif with hibiscus flower on the appetizer plates, small bowls, serving platter, and serving bowl. 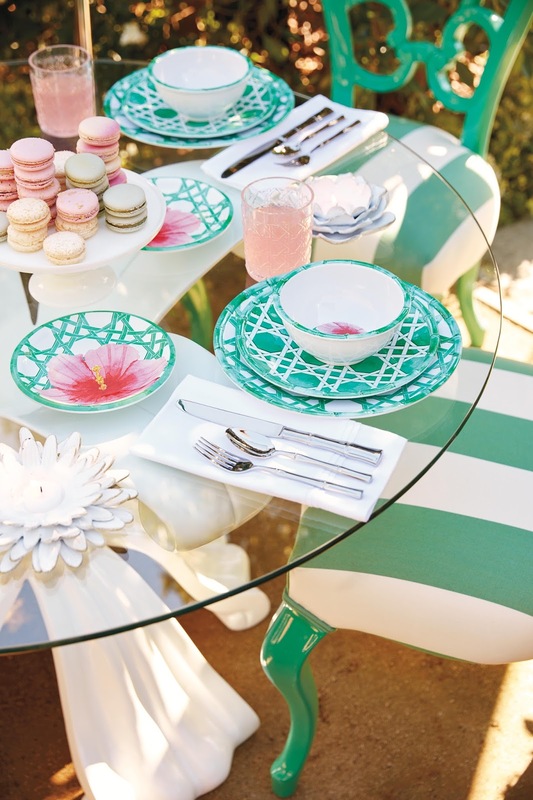 Ideal for outdoor entertaining, this chic collection is crafted of shatter-resistant and dishwasher-safe melamine. Click here to shop the entire Carleton Varney for Frontgate collection. Ah, chinoiserie! Be still my beating heart! Carleton V does it again. Marvelous collection. 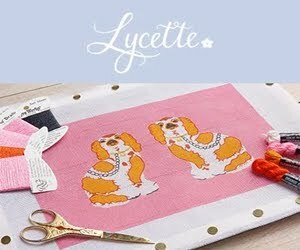 A fabulous collection and very generous giveaway Andrea! 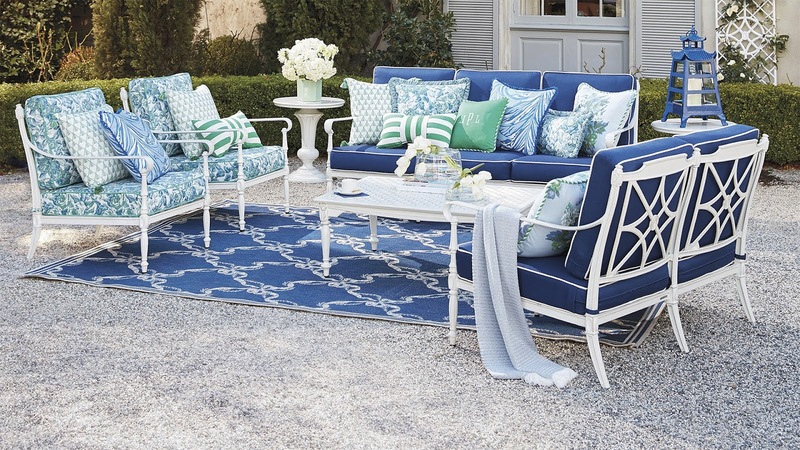 The Ibis Isle collection makes me swoon! Saw the furniture collection this weekend and nearly passed out. I love those dinnerware!!!!!! Hope I get lucky!